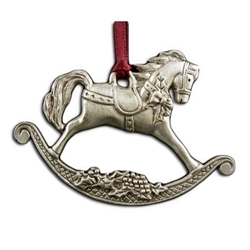 Our Rocking Horse Ornament measures 2 inches high and 2 7/8 inches wide. This Rocking Horse Ornament comes with a red satin ribbon ready to hang on your tree. This is a memories of the Christmas past. Our Rocking Horse ornament is a favorite image for generations. He is all decked out for the Holidays with holly leaves and a ribbon around his neck. There are also delicately sculpted holly and berries on the rocker. It is cast in lead free pewter in the U.S.